The farthing was a small silver and later copper coin valued at one-fourth of a penny. The name is derived from the Old English feorthing, from feortha meaning "a fourth part", probably from Old Norse fjorthungr meaning a "quarter". Additional history may be found here. Royal Farthings: The farthing coins struck by the authority of the Monarch. Though not techincally "Royal", the farthings of the Commonwealth and Protectorate (1648-1660) are included in this section. There are three main divides to this series. The first period consists of the small silver farthings first struck by Henry III and which continued through the 16th Century. The second period is the copper pieces struck under James I and Charles I. The Commonwealth pieces will be considered as a subsection of this period. 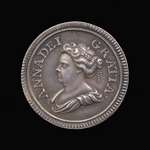 The final period is from Charles II through Elizabeth II and relates to the farthing in it's more recognizable form. Patterns, Trials, Proofs, and Current pieces are all dealt with in this section. Colonial Farthings: This section consists of the farthing or equivalent coins that were struck in territories that were either once part of the British Empire or which have become part of the Commonwealth of States. Many times the coin was specifically called a farthing, as in the cases of Jamaica, South Africa, etc. Other times a coin was called something different but served the same purpose and was of the same size as the current farthing. An example of this is the 2 Double piece of Guernsey. 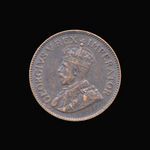 Though not specifically called a farthing, the coin had a value that was one-quarter of another, and that other coin was the equivalent of a coin. ie, 2 Doubles being worth one-quarter of 8 Doubles, which served as a Penny. 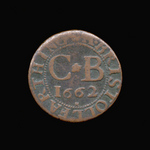 Tradesmens' Tokens: Because coins of small denominations were not plentiful, private tokens were struck and used throughout much of the history of Britain. They were abolished several times by various proclamations and recoinages, but subsequently would reappear when times and conditions necessitated their use. Here may be found listings of the various tokens issued starting with those from the 17th Century. Articles, Documents, Papers: Farthings have been the subject of many papers, documents, proclamations, etc. In this portion of the site there are links to various articles that have been written as well as excerpts from documents such as the Calendar of State Papers which mention the coin.